It’s fascinating to know that this second abundantly present amino (one after glutamine) lay its hands in varied ways on sports nutrition. – FOR POWER ACTIVITY: Present even more than glutamine in type 2 muscle fibres leading to its utmost importance for power athletes – TAURINE + CREATINE: Acts synergistic to creatine in helping the muscle cell hold more water, increasing cell volume for higher performance and supporting muscle hypertrophy. – FOR ENDURANCE ACTIVITY: Improves heart function and lowers the heart rate in endurance athletes for maximal aerobic performance. This is reason for its presence in many energy drinks. – FOR MENTAL PERFORMANCE: Has been investigated to have effects on mental cognition, attention and feelings of well being – DOSAGE: Recommended dosage is 2-3 gms per day before and after training. 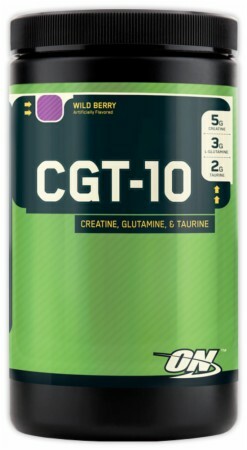 The most noted taurine product is ON’s CGT-10 giving the Taurine + Creatine synergistic effect.